May Morris will forever be in the shadow of her famous father William Morris, the chief protagonist of the English Arts and Crafts movement, and of her mother, the Pre-Raphaelite beauty Jane Burden. Yet she was an accomplished artist in her own right, a fact evidenced by the skillful design and craftsmanship of this cushion cover. From a young age, May was taught hand embroidery by her parents and she proceeded to study formally at the National Art Training School. 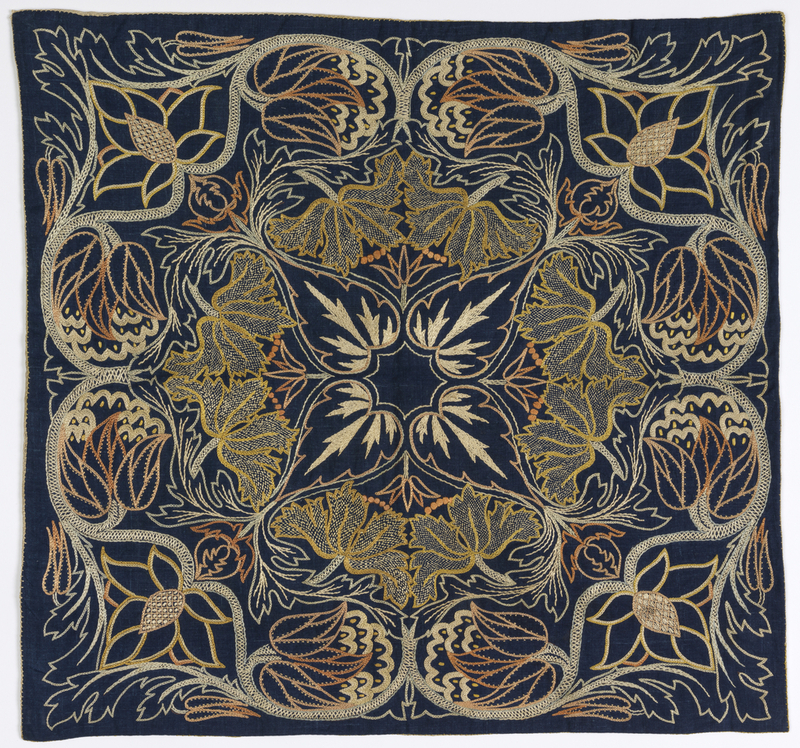 In 1885, at age 23, May became director of the embroidery department at her father’s business Morris & Co. In this post, she produced original designs for a range of domestic items including cushion covers, bedspreads, fire screens and tablecloths. The muted “artistic” colors of this cushion were inspired by those found on near-Eastern textiles and were achieved through the use of vegetable dyes rather than bright synthetic dyes. The interlacing florals suggest influence from the Turkish embroideries being imported to London from Constantinople at the end of the nineteenth century, and also strongly resemble designs made by her father. William Morris and his circle were dedicated to the preservation of traditional craft techniques threated by mechanized production; embroidery with free hand stitching was promoted as a serious art form that demanded equal skill and creativity. Furthermore, embroidery was recognized as a viable way for women to gain financial independence. Like her father, May was deeply involved with socialist projects; in 1872 she founded a charity to promote the art of needlework through arranged apprenticeships, and in 1907 co-founded the Women’s Guild of Arts, to counter the lack of professional organizations open to women. Through these endeavors and her various teaching positions, May Morris had a tremendous impact on English embroidery at the turn of the century.